The Acer C740-C4PE Chromebook is designed to be lightweight, portable, and rugged. The C740-C4PE specs includes a 9-hour battery, 11.6” full HD (1366x768) anti-glare display, Intel Celeron 320U Dual-core 1.50GHz processor, 4GB of RAM, and 16GB solid state drive. The C740-C4PE includes one USB 3.0 and USB 2.0 port as well as HDMI, headphone, and a Secure Digital (SD) card reader. The C740-C4PE communications feature a dual-band 802.11AC wireless card with multiple input, multiple output (MIMO), and Bluetooth 4.0 technology. Quality and Effectiveness: The Acer C740-C4PE is designed to fit into a backpack and withstand the rigors of a 1:1 program. The cover is designed to withstand over 130 pounds (60 kg) of force, and the corners can survive drops of over 17” (45cm). The C740 has reinforced hinges to take the strains of twisting and various stresses placed upon the unit, especially when contained in a backpack. This feature protects the HD screen which gives the user a high quality viewing experience. The TFT LCD screen features a 16:9 aspect ratio and Acer ComfyView to reduce glare and eye strain. At the top of the screen is an HD webcam for videoconferencing, pictures, or video creation. Ease of Use: Just like any other Chromebook on the market the C740-C4PE is ready to go in minutes. It can be easily joined to your Google Apps for Education (GAFE) domain with a few simple keystrokes. Its compact lightweight (2.87 lbs.) form factor makes the C740-C4PE an ultra-portable device. Along with the fast boot time, around 10 seconds, students can get to work in about a minute or so. Furthermore, the configuration of the device is a nice balance between power and battery life. Students and teachers will be able to get an entire day of use out of it without a problem. 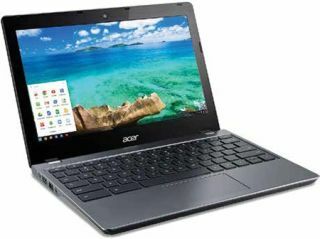 Creative Use of Technology: Acer has addressed many of the complaints that have been voiced about 1:1 programs and take home devices with the C740-C4PE. The design is rugged, yet not heavy, which strikes a nice balance for longevity and portability. The ports and communications specs also make wireless connectivity and peripheral speeds very fast. This factor is important since cloud devices rely on a good wireless connection. Suitability for Use in a School Environment: The Acer C740-C4PE’s configuration, build, and multimedia features make it a suitable device for classroom use. Since it is a Chromebook, schools using GAFE will have no issues integrating it into either a new or existing deployment. They can even be mixed with other non-Chrome devices in combination with GAFE. The Acer C740-C4PE is an excellent choice for school environments. If a school district wants to go 1:1 or start or sustain a Chromebook program, the C740-C4PE is worth a look. They are designed with schools and their specific needs in mind. They have enough power and longevity to give a good day’s work.